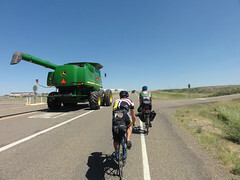 Day 22 | Wolf Point MT- Beach N.D. | captain-nicholls | Le Tour de U.S.
Wolf Point MT- Beach N.D.
We started the day expecting a major cross wind and then hoping for a tail wind for the remaining 80 kms. We definitely got the cross wind. 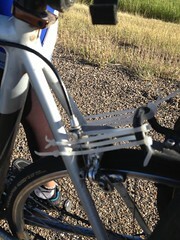 Carl got a flat 6km out of town. 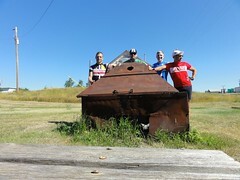 We fought the headwind for 40 kms to the hamlet of Vida. Neat little spot with some old vehicles and deteriorating buildings. 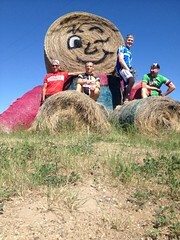 We took some shots in front of the straw bail man. 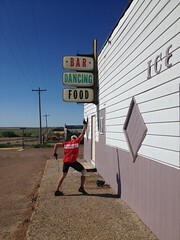 We continued on to Circle MT and had lunch at Roundhouse. 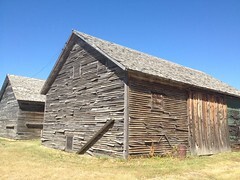 As we left Circle we noticed that the wind was to our advantage and we road to Linsday, which is another little hamlet (or gas station) with more buildings with peeling wood siding. 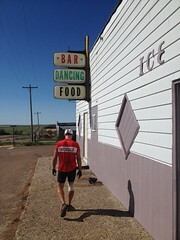 Pushing onto Glendive we arrived in good time and decided to go further and make the most of the tailwind. Carl got another flat and shortly after Francois got one as well. He also noticed that his bike rack was broken. He rigged it up and we continued on. 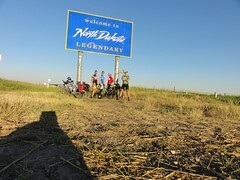 We had set our sights on Beach, North Dakota, which means we rode 228km and finally got out of Montana. Montana had some beautiful scenery but its nice to have a new state to ride in. One thing that stuck out over the last few days was the large amount of road kill that we came across. So many small and medium birds, foxes, raccoon and skunks. I don't see that in BC very often. Very rarely in fact. This guy have us plenty of room.